The purpose of the A2D Together Folder is to help hospital staff provide patient-centred care when a person with a cognitive disability is admitted to hospital. 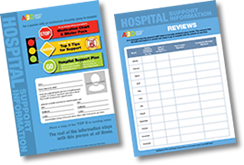 The A2D Folder provides information to improve their hospital journey, from Admission2Discharge. Cover page has important personal details and information about consent. Reviews page has dates of most recent reviews. Tips and strategies for support. Hospital Support Plan (Parts 1 & 2). Other relevant plans and reports. NSW Ambulance Authorised Care Plans (General and Palliative [Adult & Paediatric]) are a patient centered and clinician endorsed initiative designed to give patients, their families and carers choice in the type of healthcare that is best for them and where that healthcare can be delivered through supported decision making. Click on the tabs below for specific information about the key components of the A2D Folder, as well as to download copies of individual template files. The A2D Folder Cover clearly identifies the person the folder belongs to. It includes details such as the person’s name and name they liked to be called. It includes the person’s photo. Please make sure that the photo you include is a photo of the person when they are well as this may assist the health professional to get a ‘picture’ of the person’s health. This may help especially if the person is admitted in an emergency. It includes the name of the person’s guardian or person responsible and a contact number for that person. If the person is unable to consent to medical treatment, the treating Doctor has easy access person responsible/ guardian if consent to medical treatment is necessary. A special version of the cover (on the right below) has been developed for anyone who has a Palliative Care Plan or Authorised Care Plan. The Reviews page sits on the back of the front cover in the same pocket. It is important that all of the information inside the folder be reviewed regularly. For a person living in Supported Accommodation, the A2D Together Folder would be reviewed by the support staff monthly (or sooner if the person’s needs change); the manager is expected to sign and date that the review has taken place in the appropriate month. For someone living at home, this would be reviewed by the persons carer and local GP or specialist, when the persons needs change. This ensures that all information is current and accurate and ready to go to hospital with the person at any time. Any changes to the person’s status or any changes to a health management plan needs to be reflected in the folders contents on the front cover of the folder and Part 1 of the Hospital Support Plan. The red section contains the person’s Medication Chart and their Blister packed and non-packed medications. When a person is admitted to hospital the health professionals have to be provided with accurate information about the medication the person takes. Current medication charts and blister pack contain this information. 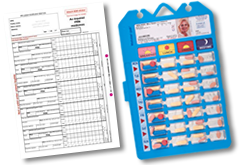 Once the information is transferred from the medication chart to the hospital medication chart it can be placed back in the A2D Together folder or can be given back to the Disability Support Staff/Carer to take back to the person’s home for safe keeping. to also give liquid medications and inhalers to the paramedic as well as the blister pack. Page 1 of the red section in this folder may contain the person’s Palliative Care Plan, End of Life Plan and no CPR order and/or Ambulance plan. It should be noted that the ambulance plan should always be accompanied by the NSW Health authorised Palliative Care Plan. These plans should be followed by their Medication Chart and Webster/blister packed and non-packed medications. This is to ensure the hospital staff see that the person have this / these plan immediately and can take appropriate measures to meet the person’s needs. TOP 5 is a tool to support people who have an intellectual disability and who live within the community. their needs, likes, dislikes, rituals and preferences for support. or use the button above to download a blank copy for your client. We would like to acknowledge the Carer Support Unit, Central Coast Local Health District for the development of the TOP5 initiative, and their generous support in sharing it. Not all staff in Health will be familiar with The Joint Guideline or are aware of the Hospital Support Plan. Part 1 of the HSP contains current and relevant personal, consent, health, medical and support information necessary to help hospital staff to provide safe and effective care to the person whilst they are in hospital. The HSP is developed and kept up to date by the disability support staff who support the person in their home. The HSP is reviewed monthly as part of the person’s A2D Together folder. The HSP is kept with the person at all times during transfer of care. 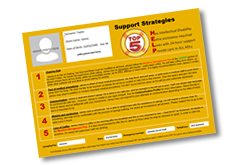 Part 2 of the HSP is designed to facilitate the sharing of clinical and disability support expertise. It is completed in discussion with the disability support staff and the nurse in charge of the ward where the person is being admitted to. This is completed at the pre admission meeting for a planned admission or as soon as the person is settled following an unplanned admission to hospital. For people living at home with their carer/family view Steps 1-5 on the ‘For Carers’ page with particular attention to Step 4. Disability Support Staff and Manager are advised to take the time to explain this to the Nurse Unit Manager or person who is responsible for the person’s admission. Discussing Part 2 of the HSP allows the hospital staff to get a good understanding of the person’s current health issues and their base line health. It is also a good time to discuss/agree on the support the disability service can provide to the person while in hospital – i.e. will the Disability Service or Health supply staff at mealtimes if the person needs support with their meals for example. 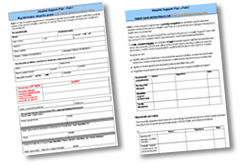 Recent specialist medical reports: This will provide valuable information to the health professional about the person’s ongoing health / medical condition(s). The front cover of the A2D Together folder will identify ALL of the support plans in the GREEN section. You need to tick the plans that are in the folder. Please only include what support plans you have in the contents section on the cover. Improving the hospital journey for a person with an intellectual disability. The Admission2Discharge (A2D) Together Project was developed to improve the hospital experiences of people with a cognitive impairment, their carers, families and disability support staff. Through improved communication and sharing of relevant and current information, hospital staff are better equipped to meet the needs of people with a cognitive impairment. If you want more information about the A2D Together Project contact us here.